In our circulatory system, arteries supply blood from the heart to rest of the body, while veins return the blood from various parts of the body to the heart. While arterial blood flows with the gravity, venous blood flows against gravity. Therefore, veins have special valves that help in bringing the blood from the feet back to the heart. When these valves grow weak, the blood circulated may leak back downwards, leading to Varicose Veins. The veins become varicosed, inflamed and painful. Generally, people who stand for long hours, or people whose profession requires them standing for long hours are at risk of developing Varicose Veins. Apart from standing for long hours, other common causes include hormonal changes during menopause or pregnancy, sudden change from warmth to cold, dietary deficiencies, loss of skin elasticity due to aging, constipation, lack of exercise, obesity, repeated heavy lifting, can all cause or worsen varicosities. Appearance of tortuous veins or spider veins, prominent dark blue blood vessels, particularly in legs and feet. Aching and heaviness in a limb after standing for any length of time. Dryness and itchiness of the skin around the veins, accompanied by ankle swelling, particularly in the evening. Discoloured, peeling skin, skin ulcers, and constant pain indicate severe varicose veins. Ayurveda refers to Varicose Veins as ‘Siraja granthi’. Ayurveda believes that there is definitive involvement of Pitta Dosha. Sometimes, along with pitta, if vata and kapha are vitiated, the imbalance can disturb the blood vessels of that particular area, causing obstruction in pathway of blood vessels, leading to Varicose Veins. Apart from the above mentioned causes for varicose veins, Ayurveda believes that varicosity may also be noticed in conditions like portal hypertension, usually associated with hemorroids, oesophageal varices etc. Kaishora guggulu – It is good skin health promoter, natural blood cleanser, joint health, natural blood cleanser, useful supportive dietary herbal supplement in other health conditions too. Sarivadyasava – a natural blood detox product, also used in treatment of diabetes, gout and other skin complications. Rasnairandadi kashayam– used in treating aches and pains related to lumbar spondylosis, low back ache, gout etc. Punarnavashtajka kwatha – used in treatment of inflammatory conditions like ascites, myxedema. Balance your vata with special herbs like Brahmi, Shatavari, Ashwagandha and Guduchi, as these herbs provide nutrients for the tortuous veins. A four week treatment with Brahmi produces welcomed benefits in the discomfort of chronic venous insufficiency. The usual dosage of Brahmi is 10ml to 20ml twice a day. Zinc is in the form of Jasad Bhasma, assist healing and collagen formation and helps maintain proper concentration of vitamin E in blood. Prasaarini tailam or Chandanabala laakshaadi tailam can be applied externally. Castor roots, Manjistha, Guduchi, Giloy, Punarnava, Sariva, Mandookaparni, Punarnavaadi gugglu, Chandra prahbaa, Naagaarjunaabhra ras, are some herbs useful in treating Varicose Veins. Powder the drugs vacha, tulasi, turmeric in equal quantity and mix well. Add aloevera juice and make a fine paste. Apply along the length of varicose vein, and allow the paste to remain so for one to two hours. 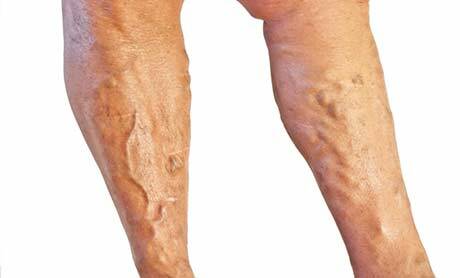 About 15 to 20 days of regular application relieves the aching pain of varicose vein. Extract juice of Karanja and castor 10ml each, and mix with 5ml honey, and consume on empty stomach for 21 days. This may help in partial correction of blood circulation in affected area. Blackberries and cherries are good for varicose veins. Vitamin A found in plenty in carrots, pumpkins, sweet potato and leafy greens are good for varicose ulcer healing. Vitamin B found in all seasonal fruits, yogurt, whole grains and pulses help in maintaining strong blood vessels. Vitamin C and bioflavonoids help in improving healing of sores, circulation, strengthen vein walls to prevent dilation. The vitamin is found in abundance in grapes, melons, lemon, pomegranate and citrus fruits. Vitamin E found in plenty in almonds and almond oil helps improve circulation, reduces susceptibility to varicose veins and relieves pain. If you are required to stand for long hours, ensure that you sit for a while in between, so that you rest your limbs. When sleeping place a pillow beneath your feet, as keeping the feet elevated ensures that there is good blood flow into the legs. Moderate exercise is necessary, as it not only strengthens your leg muscles, but also keeps blood vessels in good shape. Walking and swimming are good therapies. Wearing varicose veins socks that are available in medical stores is also a good way to prevent/treat veins of feet and legs. A daily oil massage with blends of jojoba and sesame oil mixed with herbs can improve blood circulation in the area and helps the skin and veins regain their elasticity. Inverted yoga postures can be particularly beneficial in restoring normal blood flow from legs to the heart. Sarvangaasana, Halaasana, Pawanmuktaasana series promote circulation and drainage of blood from legs. Ensure that you do not stand or sit for long periods of time. Avoid tight clothing that tightens around your waist or legs, as any condition that places excessive pressure on legs or abdomen can lead to varicosity. Quit smoking and use of contraceptive pills. It is beneficial to alternate between hot and cold baths, as it stimulates circulation to legs. Note: Each of us are of different constitutions, and respond to treatments in various ways. Therefore, Ayurvedic treatments are individually formulated. Hence, always consult a qualified Ayurvedic physician prior to treatments.